Coming into this hackathon I wanted to create a project that I found interesting and one that I could see being used. Many of my projects I have done in the past were interesting, but there were factors that would always keep them from being widely used. Often this is a barrier to entry. They required extensive setup for the more minimal reward that they give. For Hack Western one of my goals was the create something that had a low barrier to entry. However a low barrier to entry means nothing if the use is not up to par. I wanted to create a project that many people could use. Based on these two concepts, ease of use and wide ranging use, I decided to create a chat bot that automates answering science questions. What my project does is very simple. 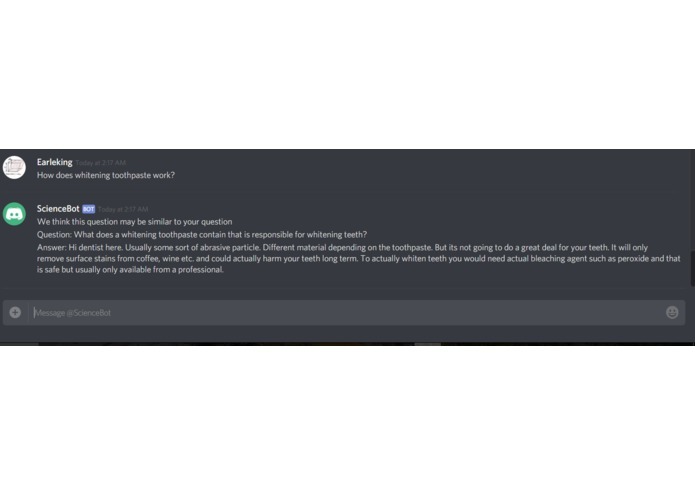 On the messaging platform, discord, you message my bot a question. It will attempt to search for a relevant answer. If one is found then it will give you a bit of context and the answer that it found. I built this project in three main sections. The first section is my sleuther. This searches the web for various science based questions as well as their answers. When a question is found, I use IBM's natural language processing api to determine tags that represent the topic of the question. All of this data is then stored on an Algolia database where it can be quickly accessed later. The second section of my project is the server. To implement this server I used StdLib to easily create a web api. When this api is accessed it queries the Algolia database to retrieve any relevant questions and returns the best entry. The third and final part of my project is the front end Discord bot. When you send the bot a message it will generate tags to determine the general topic of the question and using these it will query the Algolia index. It does this by calling the StdLib endpoint that was setup as the server. Overall these three sections combine to create my final project. The first challenge that I ran into was unfamiliar technology. I had never used StdLib before and getting it to work was a struggle at times. Thankfully the mentors from StdLib were very helpful and allowed me to get my service up an running with not too much stress. The main challenge for this project though it trying to match questions. As a user's questions and my database questions will not be worded the exact same way a simple string match would not suffice. In order to match the questions the general meaning of the question would need to be found and then those could be roughly matched. To try and work around this I tried various methods before setting on a sort of tag based system. To be honest this project was not my initial hackathon project. When I first started the idea was very different. The same base theme of low barrier to entry and widely usable, but the actual subject was quite different. Unfortunately part way through that project there was an insurmountable issue that did not really allow that project to progress. This forced me to pivot and find a new idea. This pivot came many hours into the hackathon already which severely reduced the time for my current hack. Because of this, the accomplishment that I think I am most proud of is the fact that I am here able to submit this hack. Because I was forced to pivot on my idea partway through the hackathon a fair amount of stress was created for me. This fact really taught me the value of planning - most particularly determining the scope of the project. If I had planned ahead and wrote out everything that my first hack would have entailed then many of the issues that were encountered in it would have been able to be avoided. I want to continue to improve my question matching algorithm so that it more questions can be matched. But beyond simply improving current functionality, I would like to add new scope to the questions my bot handles. This could be either increasing in scope, or increasing the depth of the questions. An interesting new topic would be questions about a very specific scientific area. I would likely need to be much more selective in the questions I match and this is something I think would pose a difficult and interesting challenge.